The enamel sink was nice, but old. It was super scratched up and had several chips and spots where it was corroding. The faucet was super old school and the seal was wasting away and this yucky black goo was constantly oozing out and making a mess. I'm not sure when this setup was installed, but it's obviously been awhile since the kitchen has been improved. Then it was time to get busy. As part of the remodel we are also updating the cabinets and counter tops and installing a dishwasher, on top of installing the entire Franke kitchen system, so there was (and still is) lots of work to be done. Luckily, B is quite the handyman and seems to enjoy projects like this. 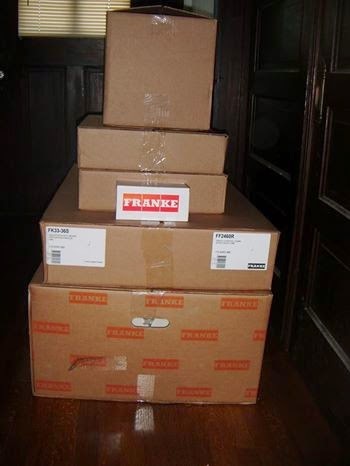 Franke sent along a main faucet and a point-of-use faucet. Our main faucet is the Pull Down Spray Faucet and the point-of-use is the Cold Water Only plus Filtration. We got them in the Old World Bronze finish to match the linen sink. We are antiquing our cabinets, so I'm sure it will all look fantastic together! This model is jam-resistant, energy-efficient and has impressive sound baffling. It's so quiet that the first time I used it, I actually thought I had broken it. The sound is super muffled, which we can all appreciate. Once we finish the whole project (hopefully before Thanksgiving:) we will be posting an update with lots of pictures of the results. We are excited to share how the total Franke Kitchen System is working for our family with y'all, so stay tuned! Start planning your dream kitchen today at Franke Luxury USA!